The Gretna Casino is part of a premiere entertainment complex that was opened just a little over a year ago in Gretna, FL. This brand new Gretna horse racing track and gambling center was engineered to provide an exciting new gambling entertainment venue to the area that is completely unique to all other entertainment and social events currently taking place in the Gretna area, and all of North Florida. The finished complex includes a casino, an equestrian center and Quarter Horse track, and a world class poker room, with a hotel being added a little later down the road. Gambling and wagering options include casino games, poker games, and horse racing. A partnership between David Romanik, the City of Gretna, and the Poarch Band of Creek Indians has made the Gretna Casino and gambling complex a reality, and is being developed as a premiere destination for tourists, outdoorsmen, horsemen, spectators, sports enthusiasts, and poker players. The developers and investors involved have endeavored to create a cutting edge facility that is considered to be an industry leader in high quality entertainment. 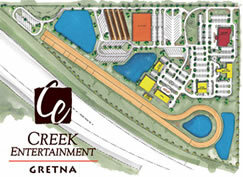 With North Florida being an equestrian-rich region, it only makes sense that horse racing would be a strong part of the culture for the area, therefor the Creek Entertainment Gretna facility is meeting a very viable need for the region, while also offering other exciting Gretna gambling platforms, such as casino gaming, and Gretna poker games. All of the traditional casino games are expected to be on hand at the Gretna Casino, including slots, table games, video poker, keno, craps, roulette, and other popular options although they are still working on the legalities to get Gretna slots approved. Developers are hoping to attract poker enthusiasts of all skill levels, and offer exciting poker tournaments and special events along with their day to day sizzling hot poker action. Until now, North Florida residents have had to travel north to Alabama, or further south to Central and Southern Florida to enjoy gambling entertainment. The Poarch Band of Creek Indians operates multiple gambling facilities, and has always provided a high quality and rewarding gambling experience, and world class facilities. Take a look at our article on the Gretna Casino One Year Later to learn more about the growth and developments that the facility has already undergone in just its first year of life.